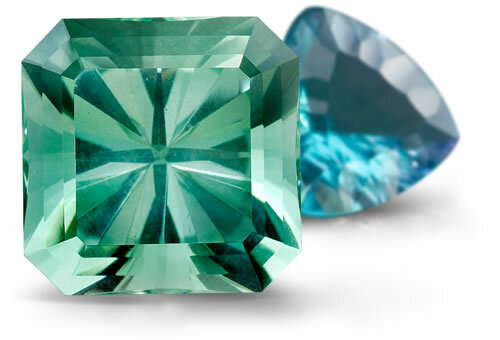 A plentiful, affordable, and colorful gem, many consider fluorite one of the most popular collector's stones worldwide. Fluorite often has excellent clarity and crosses the entire color spectrum. One of the most famous fluorescent minerals, fluorite often requires no type of treatment to enhance its appearance. Also prized for its color-change and distinctive multi-color banded varieties, this beautiful stone has so many appealing features, it's no wonder that Roman historian Pliny the Elder named fluorite his "most precious substance." Rainbow fluorite is banded and can be found in various shades of yellow, green, purple, white and brown. Stones are often irradiated to improve color. Fluorite will sometimes have triangular negative crystals, mineral inclusions, color zoning, healing cracks 2-phase and 3-phase inclusions and liquid inclusions. Might have pits or scratches on surface.